This series was written for kids ages 11 and up. 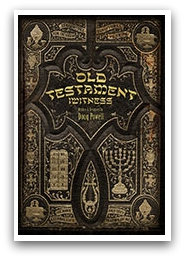 We started looking through the Old Testament iWitness book ($14.00) first. This title is a great accompaniment to an older student's study of the Old Testament in the Bible. When you look at Bible text, it can feel overwhelming for students (well anyone) to just sit and read the Bible. The Old Testament iWitness book takes their normal Bible reading and study to a different level by providing reference information on the Bible writers and prophets. There is also information providing explanation about the covenants. Apologia uses a modern font, which kids really enjoy reading instead of the typical typewritten style. 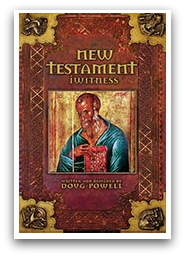 The New Testament iWitness Book ($14.00) follows your study of the New Testament in the Bible. It helps to answer questions children might have regarding the authenticity of the Bible. It provides answers to questions about who wrote the books of the bible, and give information about the men and a little about their lives. Just the the Old Testament iWitness Book, it also provides information about the prophets. Information is provided on how the Bible has been carried down to our day through translations. Through printing, manuscripts and copying procedures. It is truly amazing to see how many Bible translations there have been through the years. It's even more amazing that the translations can remain as close as they do, even through linguistic changes, to what would be the original writings. The New Testament iWitness Book takes a look at Christianity and the growth of Christianity also. 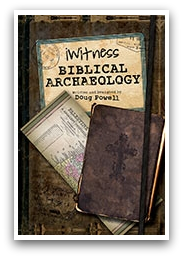 The iWitness Biblical Archaeology ($14.00) really looks into the history of the Bible. Many of the people and the artifacts have been lost for years. These items could only be read about. The iWitness Biblical Archaeology study helps the student to see the accuracy of the Bible through not only reading it, but the "proof" or "evidence" showing the accuracy. You are encouraged to dig deep into the Bible and look at the physical artifacts that help to separate the Bible as the Word of God and not just a storybook. Students are really like archaeologists digging for Bible truth. The iWitness Biblical Archaeology covers the study of the Bible from the Old Testament through the New Testament. Students will see proof of the Flood that occurred and also see the scientific information about the location of the Ark. And there is the key term....scientific proof, not just taking the word of someone else, but seeing the information from scientists including picture proof. How did we use it? Well, I highly recommend that your child be in late middle school to start this series, unless they are advanced in their study skills. Joey is delayed in this area, so he did have some trouble finding a groove/routine with these titles. It's easy to assign reading for students to go through and use this as history curriculum. You could stretch a study out over several weeks, or cover each book in just a couple weeks depending on the depth of study you are wanting to do. This study does not break down the individual books though. The iWitness books really were created to uncover the "mystery" that surrounds the Bible and answer those questions your students might be wondering about the Bible. I do have to say that my favorite out of all three books was the iWitness Biblical Archaeology. It was full of historical information and facts. It was the easiest for Joey to understand out of the set. He is delayed though in this area. This book was extremely black and white for his type of learning. As we read, he could see what was in the Bible and also the physical proof of events and people. If you are looking to provide your student with an in depth look of the Bible that will not be boring or cause confusion, the Apologia Educational Ministries iWitness series of books is a great place to get started. The price for each of these books is reasonable, and costs no more than many graphic novels that kids want to read. They are well made and full-color. Like I mentioned earlier, and I am saying this again because with my kids it is a big deal, the font for this series was well chosen. It's a down-t-earth study and looks like an average person wrote their notes. The kids will not even realize how much they are learning. Several members of the Schoolhouse Review Crew were given the opportunity to try out the Apologia Educational Ministries Old Testament iWitness book, New Testament iWitness Book, and iWitness Biblical Archaeology. If you are still not sure, check out how this product worked for their families.